A Thought: The Presence of Gold. They’re Back! 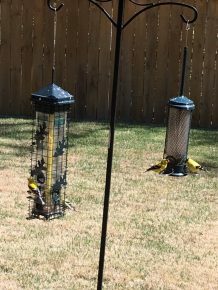 Every Spring and summer, if I faithfully fill the feeders with thistle seed, these beauties faithfully come and feast, giving us a continuous flash of Gold. But for me, it’s more than that—it’s a happy memory of my mother. 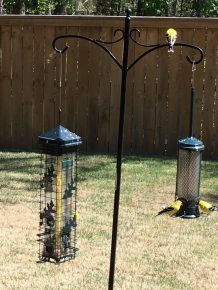 She LOVED the everyday visit by the goldfinches. So, in a strange way, I share these aves visits with the presence of Mom. God’s gift of happy memories do that for us—-fill us with joyful moments which provoke smiles. Today give thanks to God for that which gives you joy. You were created to live in joy. Don’t waste that privilege and gift!